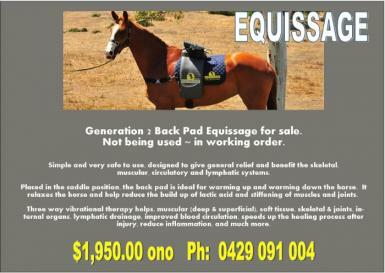 Generation 2 Back Pad Equissage for sale. Not being used ~ in working order. Simple and very safe to use, designed to give general relief and benefit the skeletal, muscular, circulatory and lymphatic systems. Placed in the saddle position, the back pad is ideal for warming up and warming down the horse. It relaxes the horse and help reduce the build up of lactic acid and stiffening of muscles and joints. Three way vibrational therapy helps, muscular (deep & superficial), soft tissue, skeletal & joints, internal organs, lymphatic drainage, improved blood circulation, speeds up the healing process after injury, reduce inflammation, and much more.